As my own approach to life is one of optimism and tenacity, I was drawn to “Grit - The Power Of Passion And Perseverance” by Angela Duckworth. It is a powerful tool for anyone who wants to enjoy personal and professional success by improving their “grit.” Duckworth conducted immense research on the subject and found that highly successful people had a kind of ferocious determination that played out in two ways. First, these individuals were unusually resilient and hardworking. Second, they knew in a very deep way what they wanted to achieve. Included in the book is an assessment for you to rate yourself. The first component of grit is your passion score — how steadily you hold to goals over time, not how intensely you’re committed. Added to this is your perseverance score, which is determined by how you fare in the face of adversity. Some people are great as long as “the sun is shining” in their lives, but they fall apart when the rain comes. Friedrich Nietzsche’s quote, “That which does not kill us, makes us stronger,” strikes a chord in this book. Duckworth notes that if you overcome significant difficulty on your own during your youth, you develop a different way of dealing with adversity later in life. She counters this group with those whom she calls “fragile perfects,” people who cruise through life, friction free, for a long time before coming up against their first real failure. They are often paralyzed by these misfortunes as they have so little practice falling and getting up again. There is hope for all of us, however. Regardless of where you may fall on the grit scale, you can improve your score with a mindset of perseverance despite circumstances. You can cultivate this skill of getting up off the floor when life has knocked you down. You can build a culture of grit within your company by demonstrating grace to team members when something they try is not a raging success. Simply put, you don’t let setbacks hold you back. Use mistakes and problems as opportunities to get better — not reasons to quit. There is satisfaction to be found from doing something important, doing it well, and doing it even though it is hard. Complacency has its charms, but none worth trading for the fulfillment of realizing your potential. 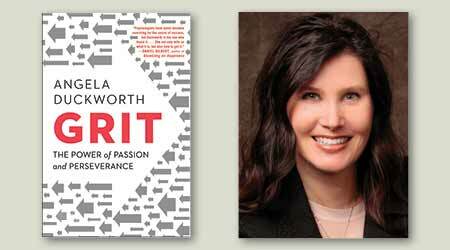 In “Grit,” published by Scribner, Duckworth uses her research, historical examples and interviews with high achievers, to explain why some people succeed while others fail.